I left home today around noon and missed a severe thunderstorm-warned cell and a flash flood warning for my area late this afternoon. 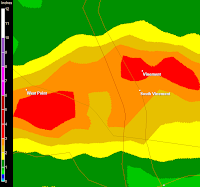 It was interesting looking at the various Nexad estimates for South Vinemont. Note that the area is a long way from all of these sites, especially Nashville. 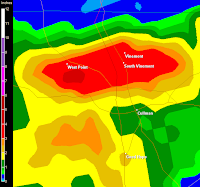 It looks like the sites differed more on the exact placement of the heavy rain a little more than the amount. It will be interesting if I am able to look at my rain gauge before another rain comes or before it evaporates. Maybe I will see some reports. The hourly reports from the FAA ASOS site at the Folsom Field Airport looked incorrect. They reported only .11" of rain. 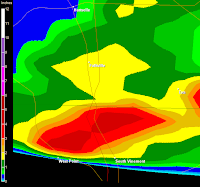 If you average the three closest radars approximately 2.90" fell. I hope they were correct. We needed the rain. The only problem is it will make me have to mow a few acres of land much sooner. I need the exercise anyway. 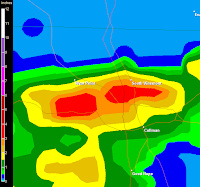 Based on radar data and other data, I think it is safe to say that we received between 2″ and 3″ yesterday. The NWS actually doesn't own the station at Folsom Field. It's an AWOS site owned by the FAA. Unfortunately, it looks like it failed during the peak of that rain event, so its totals were definitely way off. Thanks Daniel. I will correct that on my blog. I wasn't aware that it was owned by the FAA. That probably explains other concerns I have has about that site. Mikey asked if you were out in it... I guess now I know. How are you? How have you been? I haven't talked with you in such a long time!!! It has been awhile. I'm hanging in there. Thanks for asking. Hope all is well with you.